The Student Portal is where students can take online assessments, view test results, and complete assignments. This document will review basic navigation of the Student Portal Launchpad. Open an internet browser (Firefox, Chrome, Safari), then navigate to your district’s SchoolCity Suite website provided by your teacher. Your District Name and District Logo. Under STUDENT ACCESS, enter your User Name (provided by your teacher). Enter your Password (provided by your teacher). If Show Password is available, you can check this box to see your password as you enter it. Click on the down arrow next to Name to view Last Login and My Preferences. Click on My Preferences to choose and set a color contrast for reading text on an assessment. Click on your contrast choice. This color contrast will now appear on all assessments until you change it in My Preferences. When taking an assessment, this property may be turned off by the test administrator, and may be allowed for specific students only. Click Close when you are done with your selection. 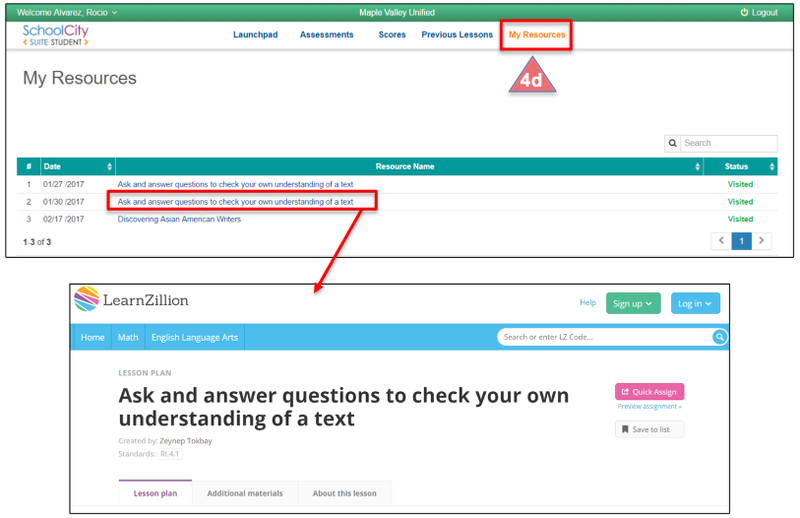 The Top Menu Bar provides links to your Assessments, Scores, Previous Lessons, and My Resources. When you click on a link, it will be highlighted in orange. 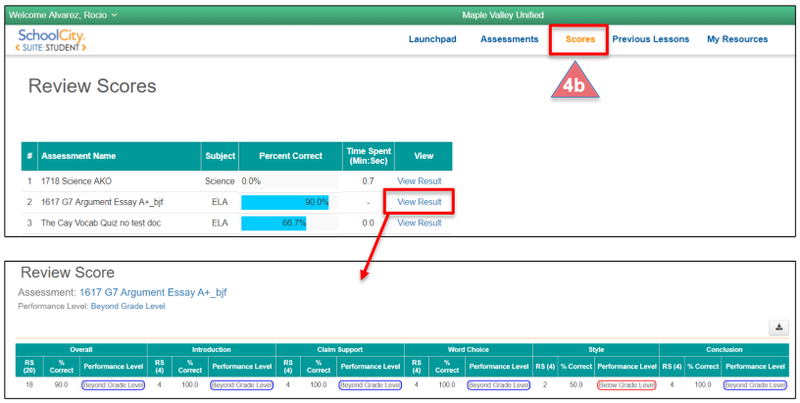 Click on Assessments to view assessments that are either Available (ready to take), Unavailable (not ready to take), or Incomplete (still taking). Click on Previous Lessons to view a list of lessons you have been assigned and completed, if any. Click on My Resources to view personal resources your teacher may have assigned to you as a result of an assessment you have taken. Click on the name of the resource to review and complete the lesson. Click on Launchpad to return to your Home page. Flip Cards provide quick links to assessments, score, lessons, and resources within the Student Portal. They correspond to the tabs in the Top Menu Bar. 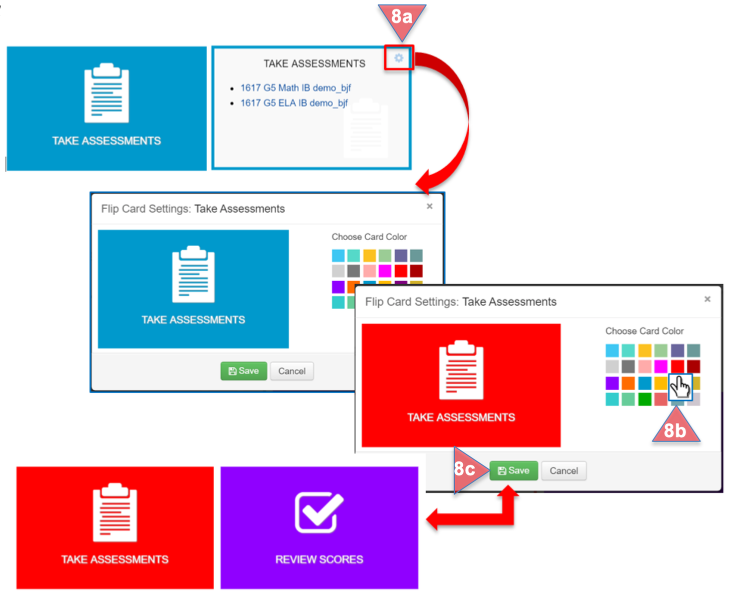 TAKE ASSESSMENTS Flip Card: Click on the card and it will “flip” over and reveal the assessments that are Available or Incomplete. Click on an assessment to begin taking it. “More” takes you to your complete list of assessments. REVIEW SCORES Flip Card: Click on the card and it will “flip” over to reveal the most recent assessments for which you can review the test results. Click on an assessment to review. “More” takes you to your complete list of scores to review. MY RESOURCES Flip Card: Click on the card and it will “flip” over to reveal the personal resources that have been assigned to you. Click on a resource title to review and complete. “More” takes you to your complete list of resources. 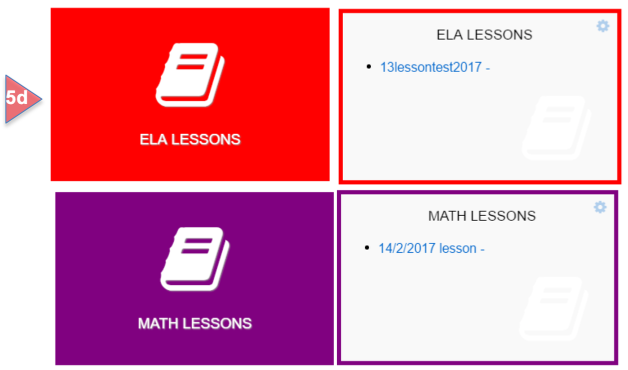 ELA LESSONS and MATH LESSONS Flip Cards: If your teacher has assigned lessons in ELA and Math for completion in the Student Portal, you can “flip” these cards to access them. Click on a Lesson title to complete it. Click on the gear icon in the blue box in the upper right corner of the screen. This will open a menu for you to choose which flip cards you want to display. Check the box next to the cards you want on your Launchpad. Flip Cards can be rearranged in any order by selecting a Flip Card and dragging it to a different position. To change the color of a Flip Card, click on the Flip Card to “flip” it. Click on the gear icon in the upper right hand corner on the back of the card. Click on the desired color in the chart. Click on Save to display the new color.